All Media Types can experience data loss. 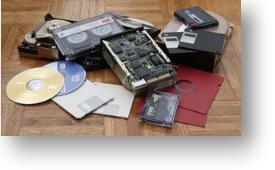 Whether your problem is with a standard hard disk drive, notebook disk drives, floppy drive diskettes, Zip drive disks, CD media, tapes, flash cards -- virtually everywhere data is stored -- we can help recover and rebuild your data. DOS, Windows, and Macintosh are the the most commonly used operating systems, but our experience doesn't end there. We have technical specialists for all platforms and operating systems including tape, Raid, SQL, DLT, DOS, Windows, MAC, Netware, UNIX, XENIX, NT, OS2, SOLARIS, HPUX, IRIX, and AIX. y work is done in our lab, but sometimes the situation calls for a visit to your location. All accross the U.S.A. or around the globe, we can put our specialists to work for you in the location that will serve your needs best. A Free Initial Consultation will enable us to outline the right plan for your data recovery need. No job is too small and no job is too large. Simply contact us through our Help! E-Mail Form to get started on your road to recovery.